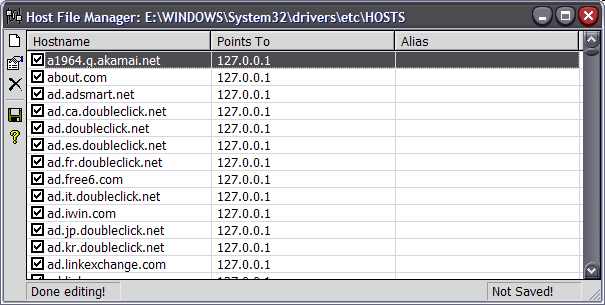 Host File Manager is a simple application that allows you to modify your HOSTS file on all modern Windows® systems. When you type an address such as www.google.com into a browser or anything else that resolves names using DNS, the hosts file is checked before it goes out to the internet to look up the IP address on your ISP‘s DNS server. This is useful if you want to block malicious addresses, or even advertisement servers. It’s also good for internal routing if you do not have a DNS server, but still would like to resolve names to other machines that do not use NetBIOS. Host File Manager requires the .NET 2.0 Framework. Anything newer than Windows XP already has this installed. Administrator privileges are required for this application to work properly. It needs read/write access to the C:\Windows\System32\drivers\etc\HOSTS file. What do you think about Host File Manager? Rate it! Hello. Thank you very much for this very useful application. It it would be possible, please add one new option to duplicate the record for host or copy/paste possibility. Regards! Thanks for the suggestion mariaczi! I will definitely look into adding an option like this for you. Good news, mariaczi! I’ve added copy/paste capability within the Hosts File Manager application. You can now duplicate as many of your line items as you want. Great and thank you very, very much! Now I can faster add new record 😉 Regards.